The constellations of Cassiopeia the Queen and Cepheus the King are filled with beautiful regions of Hydrogen gas (HII regions) and clusters of stars. In this image, the bright HII nebula at the top (slightly right of center) is Sh2-157 and is known as the Lobster Claw Nebula. 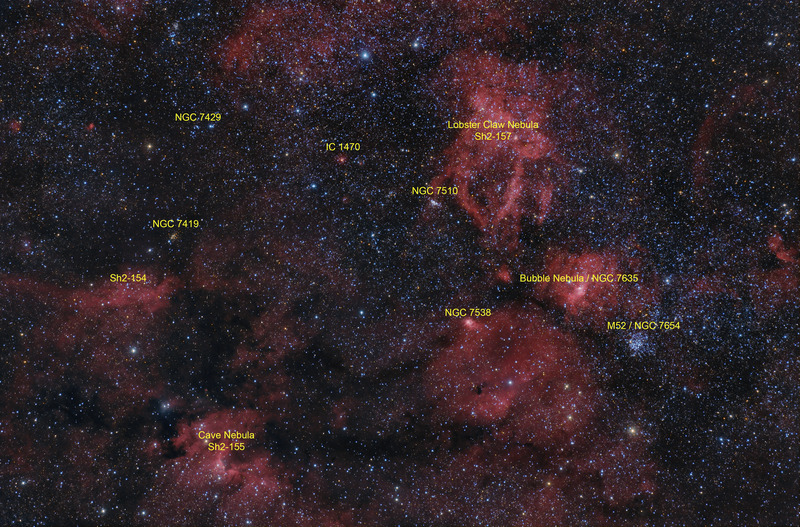 In the lower left corner of the Lobster Claw Nebula is the open star cluster, NGC 7510. To the right and below Sh2-157 is NGC 7635, the Bubble Nebula. Although rather small in this wide field photo, close inspection of the high resolution version will reveal the bubble like feature that inspires its name. Down and to the right of the Bubble Nebula is the bright star cluster, M52. This beautiful cluster contains about 200 stars. The small bright nebula to the left of M52 is NGC 7538 (at 4 o'clock, close to the center of the image). The fairly bright nebula in the lower left of the image is Sh2-155, the Cave Nebula. 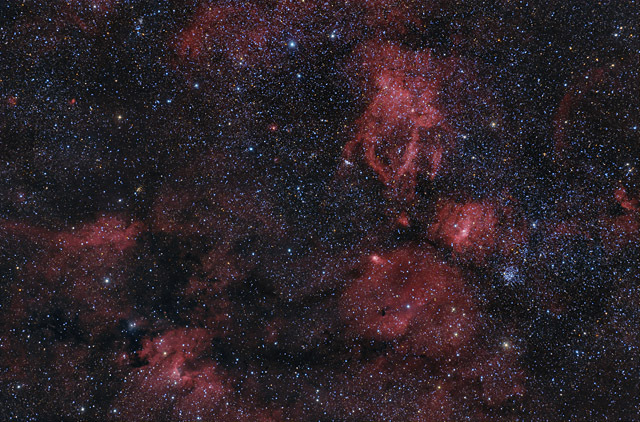 The fainter nebula at 9 o'clock in the image is Sh2-154, while the cluster immediately above it is NGC 7419. The objects in this image can also be seen in the Annotated Version. The Hydrogen Alpha Only Version of the image shows the distribution of the Ha nebulae in this field of view. Software Used Images Plus 5.75 for camera control, calibration, stacking, digital development, feature mask, smoothing and noise reduction, and multiresolution sharpening. Photoshop CS5 used for levels and curves, high pass filter, screen mask invert, selective color, hue and saturation colorizing, and unsharp mask. Gradient Xterminator for gradient removal. HLVG for color correction. Registar for aligning and registering stacks. Carboni Tools for additional noise reduction, and smoothing. Focus Magic for focus restoration. Notes There are so many varied objects in this image that I found it quite challenging to combine the Ha and RGB and maintain fairly clean colors. Ultimately, I'm quite pleased with the final image, as it contains some nice detail and some overall good color.